You've heard me talk about this game often enough during ABOG podcasts, and it was also the basis for a homepage blog post not long ago. It's also been a topic of ongoing discussions pertaining to a number of wide-ranging review scores. I figured it was due time for me to post my own impressions of this game. Is it the start of something big for Capcom or the death knell of this long-running franchise? Broken into 3 individual and full-length campaigns - and unlocking a 4th upon completion of the game - Resident Evil 6 is nothing short of a massive horror/action game with an incredible amount of replay value. Although the outcome of the game won't necessarily change from one playthrough to the next, having the ability to choose from 6 individual characters to play as across the 3 separate - and interwoven - storylines has the potential to realize dozens of hours of gameplay. Adding to the impressive scope and size of Resident Evil 6, gamers also have the option to play through it as a single player experience as well as online or in couch co-op mode. In an industry that often sees story-driven games reduced to a mere 4-5 hour experience, this is a welcome change. After completing a mandatory prologue (think of it as Capcom's way of providing a tutorial for a much needed gameplay overhaul), you'll have the option to select from and begin playing any one of the 3 separate campaigns: Leon Kennedy & Helena Harper, Chris Redfield & Piers Nivans, or Jake Muller & Sherry Birkin. Each campaign offers an experience that is unique from the others while maintaining a consistent set of gameplay mechanics. Where Leon and Helena's campaign harken back to a more classical style of Resident Evil moodiness (dark hallways and shambling zombies), Chris and Piers' campaign takes on a more military feel (faster pacing with a focus on weapons). Finally, Jake and Sherry's campaign mixes things up even further by changing the tone yet again and delivering a more tension-based experience where it's better to run for your life than prove your combat effectiveness. Where each campaign has its own distinct feel, they all utilize a new (and in my opinion, better) gameplay and control interface. Gone are the "tank controls" that have plagued the Resident Evil franchise for as long as I can remember. Welcome, Capcom, to videogaming in the year 2012 - glad to see you could make the party. Although I'm obviously poking fun at Capcom, the changes they made to the controls are both welcome and much improved from the likes of Resident Evil 4 and 5. Most notable, the (common sense) ability to move and shoot at the same time. For a gameplay mechanic that's been around for years - and one we've all come to rely on - it's completely transformed the awkwardness that was gunplay in Resident Evil . . . and it feels good. Adding to that sigh of relief, newcomers to Resident Evil 6 will also have the ability to roll from side-to-side and shoot while on your back, as well as use a quick-shot option to stun enemies when up close. Managing your inventory has also been overhauled. Utilizing the controller's directional pad makes for a quick change in weapons equipped. There is also the ability to do a quick combine and quick heal while using the customary green and red herbs. These are all just a sampling of the improvements Capcom has (finally) made to Resident Evil's game controls, and I couldn't be happier. Building on the success of Resident Evil 5, Capcom continued to focus their efforts on designing Resident Evil 6 with a solid co-op element. Each of the 3 campaigns provides for either couch or online co-op while still offering fans of the series the option to experience this epic game entirely solo. I'm happy (and grateful) to announce that I was able to experiment with both options during my playthrough of Resident Evil 6. While they each provide solid gaming experiences (and I ultimately preferred the co-op) I was pleasantly surprised by the quality of the single player option. I completed Resident Evil 5 entirely as a co-op experience, but this wasn't until after several failed attempts at playing the game in single player. I failed not because the game was so crushingly difficult (although it was tough), but because "babysitting" your partner AI, while navigating a notoriously difficult control scheme, made for a failed proposition nearly from the minute go. This is yet another shining example of how Resident Evil 6 has improved by leaps and bounds since the release of Resident Evil 5. If you're playing RE6 in single player you need not worry about incompetent AI partners. They have matured over the years and have grown into big boys and girls. In other words, they can take care of themselves while appropriately watching your back. I was able to play through and enjoy all of the Leon Kennedy and Chris Redfield campaigns in single player before being invited to play the remainder of the story - Jake and Sherry - in a co-op experience. Where playing Resident Evil 6 on single player was better than average (and much better than I was anticipating), playing the game in online co-op with ABOG member Close_2nd was an absolute joy. Working as a team goes well beyond reviving your partner and jointly opening large doors. 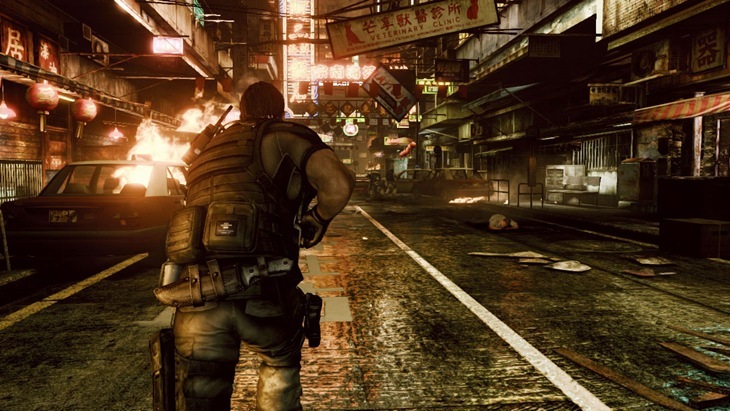 Sure, that basic level of co-op is still clear and present from start to finish, but Resident Evil 6 ratchets up the co-op mentality by requiring effective communication through voice chat, strategic planning of your offensive (and often defensive) maneuvers to succesfully navigate the more treacherous encounters, and constantly watching each other's back. With the high degree of replay value Resident Evil 6 has to offer it's likely I'll be jumping back into any available co-op(portunity) that comes my way. Aside from the gameplay achievements Resident Evil 6 offers with it's new and improved controls, I can honestly say that the visual and audio representation is some of the best I've experienced in any console game in all of 2012. The in-game visuals are easily on par with the over-the-top beauty of the multiple cut scenes, and the audio - whether through a good headset or quality surround sound speakers - was top notch. I never encountered frame-rate issues or audio glitches during any of the 20 plus hours of gameplay. In fact, the only real hiccup I ever experienced was when things would get a little cramped and crowded. Situations involving close quarters and a fair amount of enemy AI resulted in a confused camera. It made those frantic situations more intense and somewhat frustrating. Aside from that Resident Evil 6 ran smooth as butter . . . and it showed. In addition to the lengthy campaign, Resident Evil 6 also provides a few online multiplayer modes. Mercenaries is available from the start (i.e. no need to unlock it). It's basically a test to see how long you and a partner can survive wave after wave of the undead and infected. It was fun for short periods of time and allowed for a number of environments to play in as seen throughout the campaign, but it wasn't anything that really held my interest beyond a handful of sessions. Agent Hunt mode, on the other hand, had me intrigued from the first time I read about it. Allowing you to "infect" another gamer's campaign (if they allowed it on their game settings) and play as either a respawning zombie or infected - depending on what part of the game you jump into - sounded like a lot of fun. However, the great strides forward Capcom took with re-working the control scheme were left by the wayside for Agent Hunt. It's not unusual to think that controlling a variety of the undead might be difficult; they are, after all, dead. I would expect them to be slow and lumbering. What I didn't expect was a frustrating battle to get them to even move in the direction I wanted them to. Agent Hunt is a great idea but one that simply wasn't executed very well. It feels as if this was a last minute add-on that didn't receive the proper care and attention that the rest of the game received. Mediocre multipayer aside, I had an absolute blast with Resident Evil 6. It captured all the various gameplay elements fans of the series have come to love: dark and shadowy corridors, action set pieces, and ridiculous plot lines. Critics of Resident Evil 6 have made the claim that it was trying to do too many things to satisfy too many gamers and, as a result, it's focus was lost. I couldn't disagree more. Yes, there was a great deal of variety across all 3 campaigns but it didn't take much to overlook any plot holes that may have come up during the lengthy campaign. My initial reservations about purchasing this game were quickly dissolved after getting a feel for the new and improved controls - what a difference they make. Fans of the early Resident Evil games may have abandoned the series long ago, but supporters of the more recent games - Resident Evil 4 and 5 - are certain to have good time.